Today’s hike was a short jaunt on the day before Father’s day. I had seen a posting on another website talking about this trail, and I knew it was a short hike and I needed a GPS track of the trail, so it seemed like a good option for the day. Got a bit of a late start, and I wish I hadn’t. There was LOTS of traffic on the roads today. If I had left earlier, it would probably have been less crowded. No matter, I finally arrived at the trailhead about 10:30 and found two other cars there, which was surprising. I thought this trail was pretty lightly traveled. Anyway, after a few minutes of getting ready, we headed down the trail. The beginning of the trail was rather uneventful, hiking through sparse woods. Once we got to the meadow, it started to get really wet and soggy. The trail going into the meadow was under 3-6″ of water, which made travel a bit difficult. Once in the meadow, it was still wet, but less so. Walking through the meadow it was a little tough to follow the trail since it wasn’t too evident in places. There are a few posts to help guide you, but basically you just stay to the right and eventually the trail re-enters the woods. 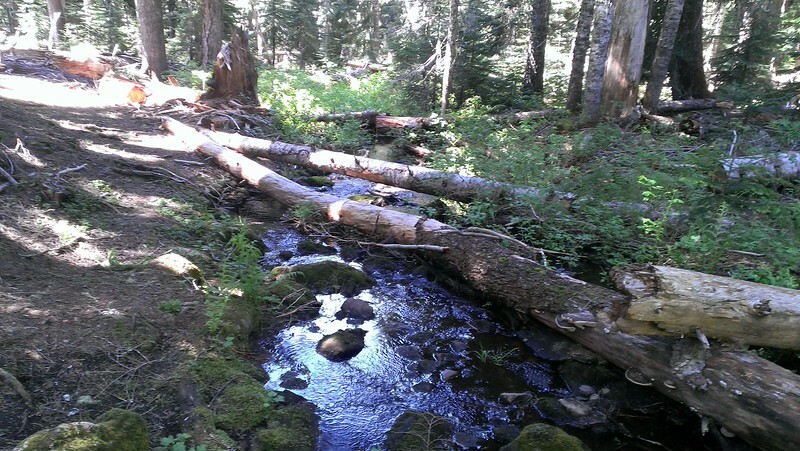 A short while after re-entering the woods the trail crosses Anvil Creek, which was kind of nice. The creek was flowing pretty well this time of year – draining the meadow. The trail was well blazed and easy to follow in the woods. 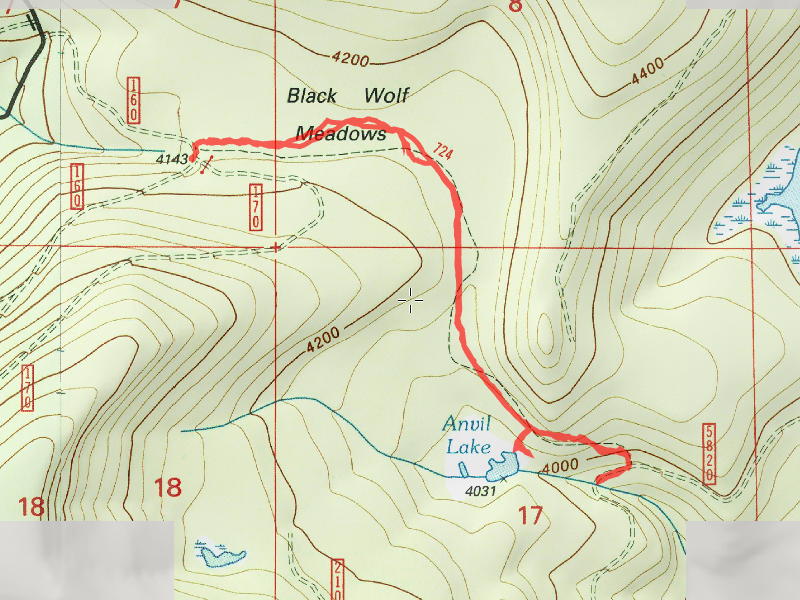 A little while further is the junction to the short side trail to Anvil Lake. We opted to keep going straight, to the other end of the trail at road 5820. The rest of the trail was pretty uneventful, however it did head downhill a bit to the road. Once on the road, we walked down to where Anvil Creek crosses the road just to see what it looked like. You can’t see much since it goes under the road in a culvert and was pretty well hidden by undergrowth. After turning around, we took the side trail to the lake. It is a pretty short trail (1/8 mile?) Anvil Lake is shallow and brushy, and the bugs were pretty thick, just like they were in the meadow. I’m sure they are all hungry! On the way back, we stopped to enjoy some of the flowers along the way. 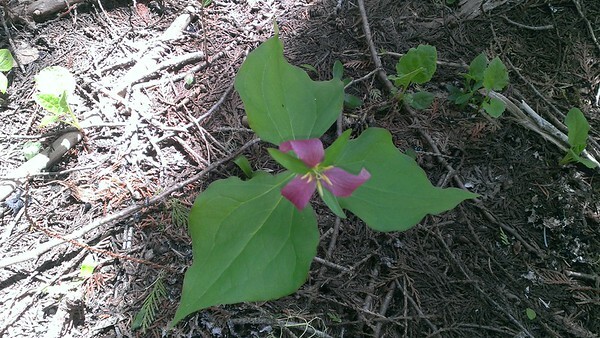 I found an interesting bunch of what I think are trillium’s, but they were not white – they were kind of a purpleish color. Very interesting. 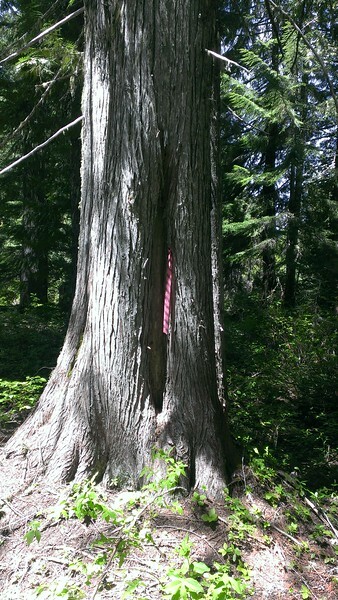 Lastly, right before the trailhead, I noticed black and pink striped flagging on a tree. This typically is left by the FS historian, and it denotes some sort of historical artifact. I looked around but could not find anything that looked like it might be historical. 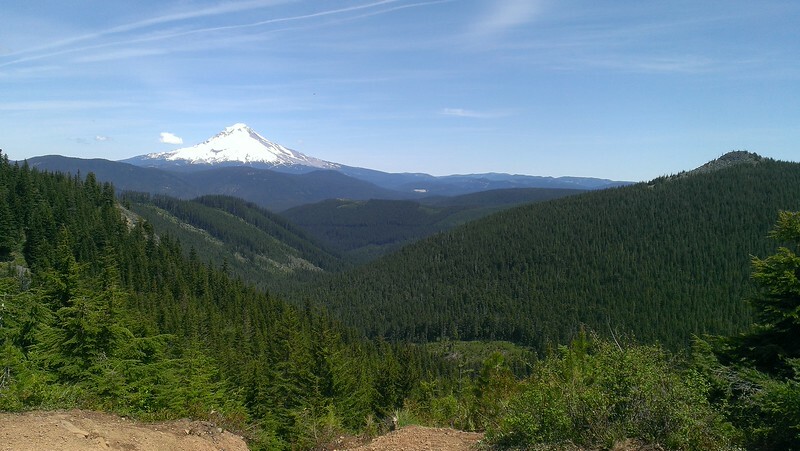 A mystery for another day…..
On the way home I stopped at High Rock and took in the view – Mt Hood was BEAUTIFUL today – very clear. I also did a little scouting for a good spot to do a cross country hike to try and find the big old growth down in the Roaring River (stuff that wasn’t burned in the big fire 100 years ago). I think I may have a good idea of where to take off for that hike, but that will also be for another day. All in all a short, but nice day in the woods.